LAS VEGAS (October 30, 2018) – Oklahoma-based Classic Recreations revealed its highly anticipated, officially-licensed 1969 Boss 429 Ford Mustang continuation car at the 2018 SEMA Show today. Classic Recreations is the only continuation car builder licensed by Ford Motor Company to offer the 1969 BOSS 429 Mustang as well as the 1969-1970 BOSS 302 and 1969-1970 Mach 1 Mustangs. The Classic Recreations BOSS 429 Mustang was built from an original 1969 Mustang body and restored to factory condition in-house at Classic Recreations. 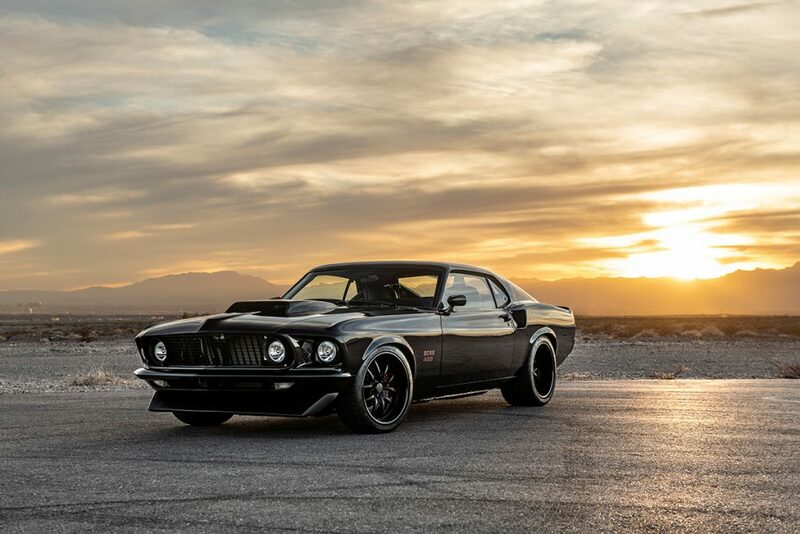 Equipped with a custom-built BOSS 429 engine, the iconic car features an updated valvetrain and cutting-edge electric fuel injection and engine management systems. The 815 horsepower, 546-cubic-inch crate engine with Kaase Boss 9 cylinder heads is mated to a Tremec manual transmission with a Centerforce DYAD twin disc clutch and flywheel. Built to maintain stability at high speeds, the BOSS 429 features a 4-link rear suspension and front tubular upper and lower control arms along with adjustable coilovers and oversized sway bars. In the sound department, the Classic Recreations BOSS 429 utilizes MagnaFlow stainless steel performance mufflers and stainless steel Worx long tube headers that give the car an aggressive sound and allow its 815 horsepower engine to breathe. For traction, both on the road and the on the track, Classic Recreations equipped the BOSS 429 with Michelin Pilot Sport 225/40/18 front and 315/30/18 rear tires mounted to the all-new VF529 wheels from American Racing. Made in the U.S.A., the forged 6061 aluminum 2-piece wheels are designed to maximize strength while maintaining optimal weight for autocross and track performance. To deliver braking performance capable of matching the Mustang’s power, the BOSS 429 utilizes slotted and cross drilled Zinc-washed rotors mated to Wilwood 6-piston front and 4-piston rear brake calipers. Classic Recreations also installed a Flaming River tilt column and complete rack and pinion steering conversion. Fuel delivery is handled by a Vaporworx Electric Fuel Pump inside of an Aeromotive Stealth 18-gallon fuel cell. The BOSS 429 received a custom “Vengeance Black” monochromatic paint job using BASF paint as well as a number of other upgrades including Kicker Audio speakers, TMI seats and custom console, an Old Air Products A/C unit, and a Lecerra Aluminum Steering Wheel. Staying true to the original, the BOSS also features factory BOSS 429 200 mph gauges. For more information on Classic Recreations officially-licensed 1969 Ford BOSS 429 Mustang continuation car or Classic Recreations other services visit Classic-Recreations.com or call (405) 577-6464.